Is some vampiric beast preying on innocent goat herds in Africa? Frighteningly, yes, that’s exactly what’s happening! But what’s behind slayings? 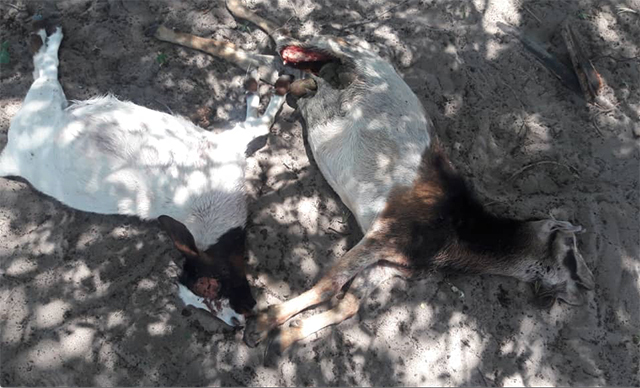 A recent spate of creepy goat deaths has shepherds in Namibia concerned and scared, as nearly 30 goats have been found dead and drained of all their blood. Residents believe something is stalking their livestock in the night, and then leaving behind no trace of its attack (besides the goats’ corpses). However, a few witnesses have come forward to say they’ve caught a glimpse of the killer (or killers), which they claim resemble large black dogs. Read the FULL ARTICLE from Mysterious Universe here and the original report in The Namibian HERE.